The Arabian Oryx became extinct in the wild in the early 1970s and has been slowly reintroduced since 1980. The vast majority of them however still exist in protected reserves and the IUCN Red List still classifies the species as Endangered as only just over 1000 exist in the wild. 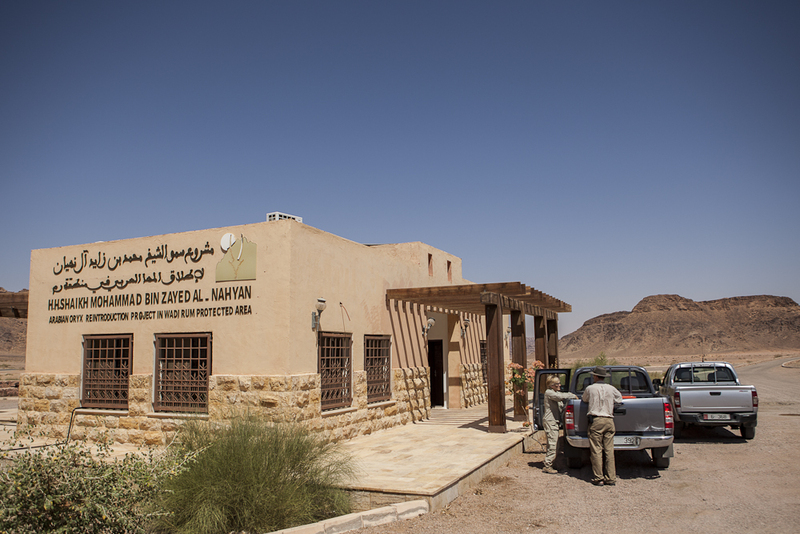 One such protected reserve is in Wadi Rum, Jordan and it just so happened that whilst staying at the Canary Hotel in Amman, I met, Dr. Cotton, a lovely woman vet who was living in Aqaba and working at the “Arabian Oryx reintroduction project” so when she invited me to join her on a trip to Aqaba and to stay at her house I jumped at the chance. 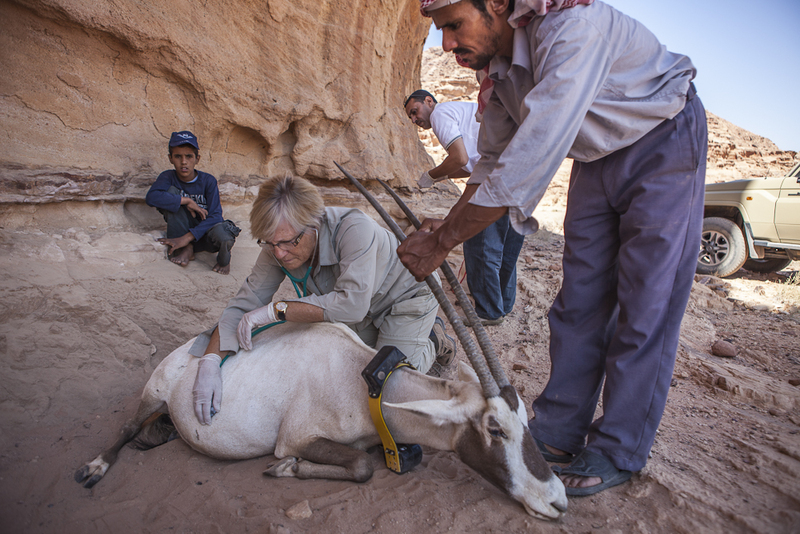 The next day I was lucky enough to accompany Dr. Cotton and Dr. Montaser (A Jordanian vet also working at the project) into the protected Oryx enclosure in Wadi Rum as there was a sick animal that needed immediate attention. This was quite unusual as the area is closed to the public and it was only because I was there at the invitation of Dr. Cotton that I was allowed to enter and document what transpired over the next few hours. On arrival we found the clearly sick animal with a distended abdomen lying in the shade next to a cliff, making no attempt to evade human contact. Over the next 1 1/2 hours the two vets did what they could to save the animal but it quickly became apparent that it was not going to survive. Dr. Cotton was wonderful in explaining to me throughout what they were doing and why she was sure that without immediate surgery, which may well have been to late at that point and impossible to perform out in the desert, the animal was not going to survive. After the animal passed away (which I admit was pretty hard to watch) it was loaded into the back of the pickup truck to be taken back to the Reintroduction project’s lab to have an autopsy performed to discover the exact cause of death. It was to be the first time I had ever witnessed an autopsy and having been a vegetarian for more than 20 years it was not something I was really looking forward to, but the chance to photograph the story of this amazing looking endangered animal and discover the cause of it’s death meant that of course I was going to stay until the end. I tied a scarf around my face, much to the amusement of the Bedoiun guides and the Doctors, but I knew that whatever smell was coming when the animal was cut open I wasn’t going to enjoy it and I wanted to be able to keep working without throwing up. Amusingly within a few moments of the autopsy beginning the smell forced all the Bedoiun men to leave the room, but due to my trusty scarf I managed to keep my breakfast where it was supposed to be and document the entire process. 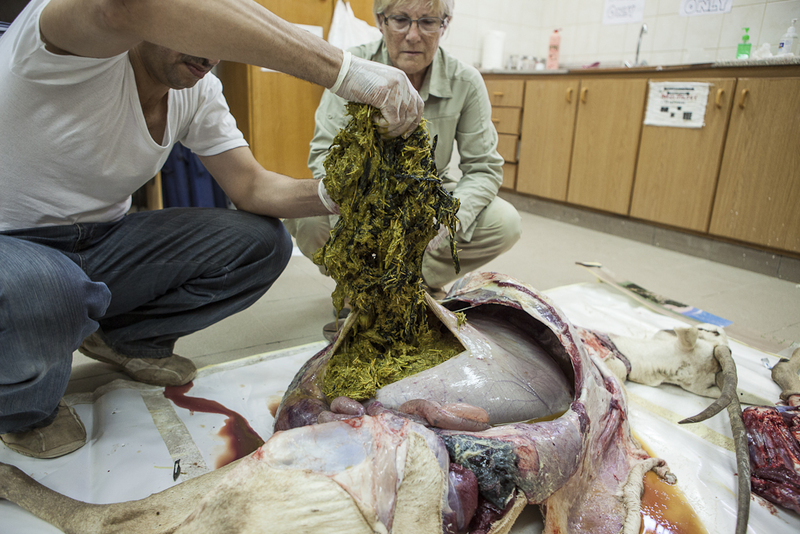 As the autopsy progressed and the stomach was cut open the cause of death became very clear – a huge mass of chewed and torn plastic bags had blocked the animals digestive system leading to “a clinical gastrointestinal catastrophe ¹ “. A diagnosis of “rumenal obstruction by foreign body, superimposed on which was rumenitis and subsequent peritonitis ² ” was made. An endangered species in a protected reserve out in the desert dying from eating plastic bags? How could this happen? Many domestic and livestock animals in the region (and worldwide) die each year because of ingesting plastic bags, a horrible and preventable loss. 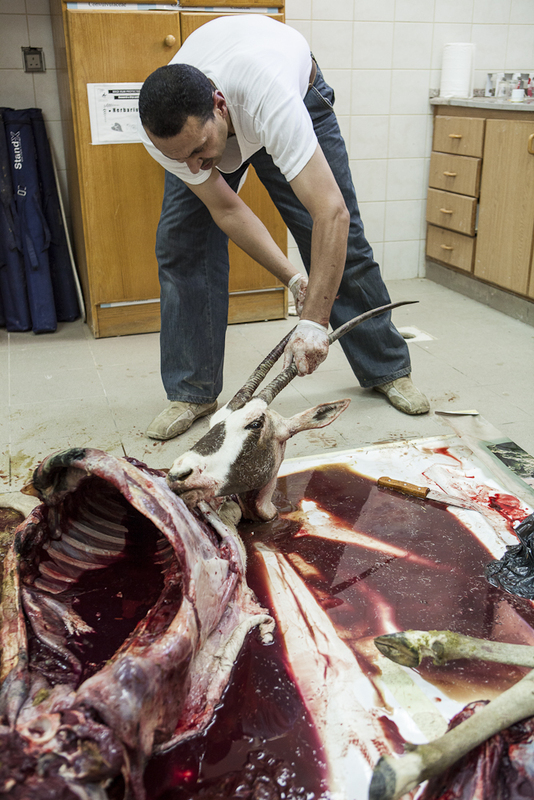 When the autopsy was over the cut up pieces of the body of the Oryx, minus it’s head which was to be kept at the project, were loaded into the back of the pickup truck and we were driven back to Aqaba. 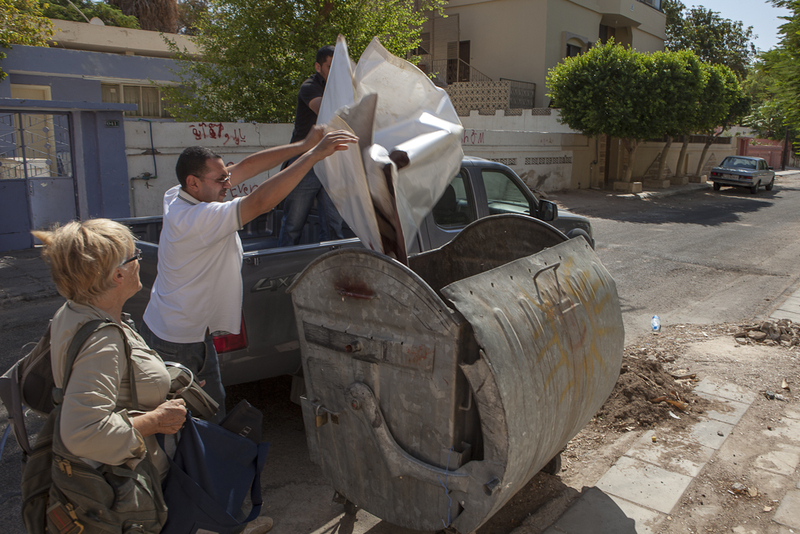 Here the final shocking moment of the whole experience occurred, not knowing what else to do with the carcass of this beautiful animal, the remains were dumped into a street bin to be taken away the next day with the garbage collection! It was a strange end to the saga which had begun a few hours before as we drove into the enclosure. 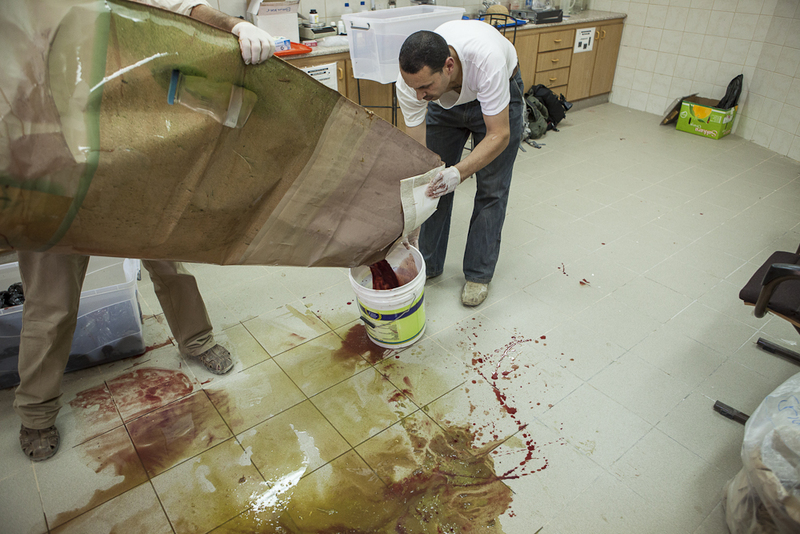 The whole experience left me with some interesting photos, an increased knowledge of the Arabian Oryx, my first autopsy experience and a shocked look on my face as the body of the creature was unceremoniously dumped into the garbage and Dr. Montaser and the driver pulled away into the warm sunshine of a small back street in Aqaba. 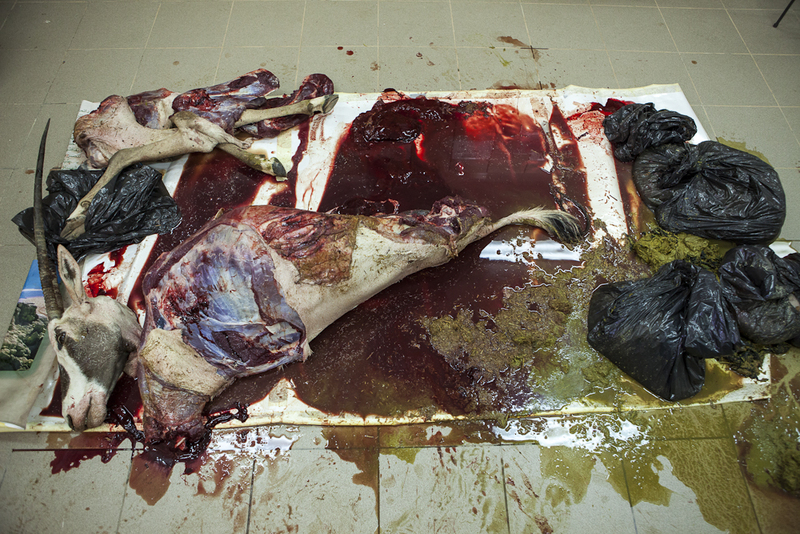 The photo gallery below contains graphic images of an autopsy, you have been warned! 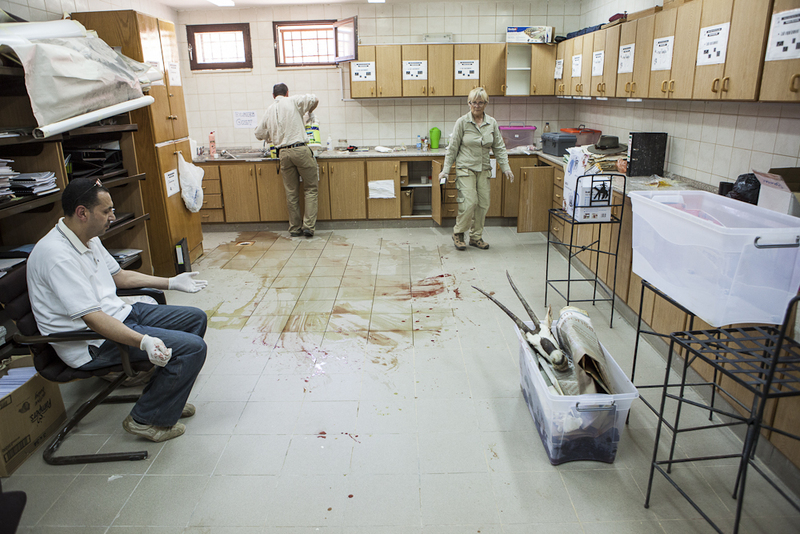 A big thank you to Dr. Cotton and Dr. Montaser for giving me the opportunity to visit the enclosure and watch them work and a special Thanks and a big hug for Dr. Cotton for her hospitality, friendship and excellent conversation while I was in Jordan.